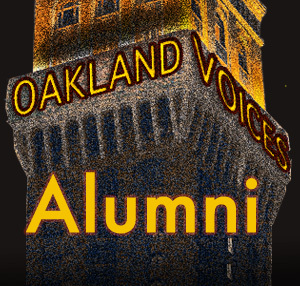 The OV team was assigned to interview East Oakland residents about Where Is East Oakland and What Is East Oakland Now. I interviewed six subjects and five of them were included in our video, presented at KALW local public radio’s Sights and Sounds of East Oakland event in May. Avraham had more to share than the others and his interview couldn’t be included. Avraham speaks about immigration, illegal dumping, how AC Transit’s BRT project is affecting his business, prostitution and more. Avraham was first interviewed in my article, Sweet and Bitter. He was very open and knowledgeable, I knew that he’d be a good future source. KALW has their next event scheduled for July 31st, from 6-8 p.m. at the 81st Avenue Library located at 1021 81st Avenue. It’s a free, family event with bilingual multi-media storytelling, food, and music. The OV team will be there video-recording your reply to the same question. Tongo Eisen-Martin, Poet/Educator will be setting it off! For more information, visit www.sightsandsoundslive.org!